Atlanta's Hectov Villalba celebrates his goal. @ATLUTD. 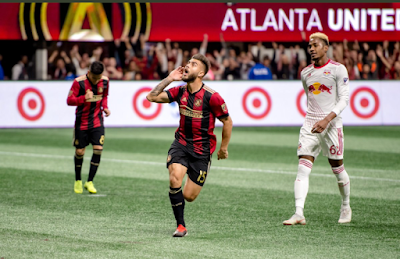 In the first leg of the Eastern Conference Finals on Sunday night, Atlanta United took advantage of being at home and beat the Red Bulls, 3-0. The second leg is Thursday night at Red Bull Arena, and the Red Bulls need to score three goals to send the match to overtime, or four to win outright. If Atlanta gets one, which would be a "road goal," the Red Bulls would need to score five. Atlanta got on the board in the 32nd minute when Josef Martinez gave them a 1-0 lead on a feed from Jeff Larentowicz. It stayed that way into the second half, when it appeared the Red Bulls tied it on a goal from Bradley Wright-Phillips that was taken off the board after a review. Soon after, Franco Escobar, on a feed from Julian Gressel and Miguel Almiron made it 2-0 in the 71st minute. In the 95th minute, Atlanta got the one that really made the plane ride back to New York extra painful for the Red Bulls, when Hector Villaba made it 3-0. Franco Escobar got an assist on the back-breaking goal. This was Atlanta's first win in five all-time matches against the Red Bulls. The Red Bulls were blanked in an away playoff match for just the eighth time in 29 away postseason games in franchise history. It was just the second time in club history that they were defeated by three or more goals in a playoff match. The last time they fell 3-0 in a playoff game was at Chicago on September 26, 2000. The Red Bulls started four Homegrown players in an MLS playoff match for the first time in league history.